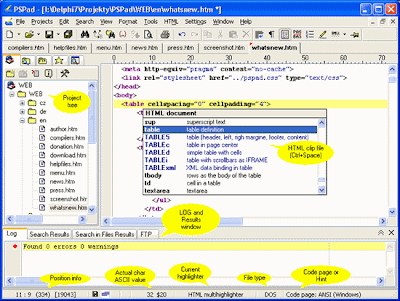 PSPad Editor is a simple yet powerful universal freeware editor for Microsoft Windows . it's specially designed for people who work with plain text. it offer various useful formatting functions, including a spell-checker, hex editor, CP conversion, text differences, templates, macros, auto-completion, Code Explorer and much more. PSPad Editor is very easy to use and easy to install. The editor supports many file types and languages (VB, C++, SQL, PHP, ASP, Python etc.) with syntax highlighting. You can use PSPad as good IDE for any compiler. There are macros, clip files and templates to automate repetitive tasks. An Integrated HEX Editor, support for project, file browsing, built-in FTP Client, Macro Recorder, File Search/Replace, Code Explorer, Code page conversion... these are just some of the many features that PSPad offers.